City of Toronto Archives, Fonds 1244, Item 56. As for what this depicts, well, that’s the whole premise of this post. My latest Historicist article is the story behind what is believed to have been the first automobile in Toronto. I’m not the first to have written about this subject, and some readers might notice that the information in my article contradicts some of the other articles out there. A lot of these discrepancies stem from the above photo, which accompanies many articles about Toronto’s first car including mine. It is a photo from the William James collection at the City of Toronto Archives, and it’s pretty cool-looking. And the handwritten caption seems to supply some useful information. Or does it? I first learned about this subject through my position on the Etobicoke York Community Preservation Panel. Some buildings on Lake Shore Boulevard recently went though the heritage designation process, buildings which were originally part of the Fetherstonhaugh Estate. Aside from being one of the first people to build a swanky estate in Mimico, F.B. Fetherstonhaugh is generally known as the man who owned Toronto first automobile. The Canadian Mint even depicted the vehicle on a coin in 1993. The City’s background file on the Fetherstonhaugh property [pdf] says that Fetherstonhaugh’s car made its debut in 1896. The problem is that the handwritten caption on this photo clearly says it was in 1893. So I started looking to see what others had written. The first account I found was in Mike Filey’s More Toronto Sketches (Dundurn, 1993). In an article originally written in 1979, Filey gives the year of Fetherstonhaugh’s car as 1893, and adds that it was displayed in the same year at the Exhibition. I looked at newspaper accounts of the 1893 Exhibition to find a description of the car’s demonstration. If this was the first automobile in Toronto, surely it must have caused a sensation, right? Only I didn’t find anything about motor vehicles at the 1893 Exhibition. What I did find was a description of an exhibit by Dixon’s Carriage Works, which was the Toronto business which supposedly built (and tested) Fetherstonhaugh’s car. The article mentioned all the horse-drawn carriages Dixon had on display, but nothing about a motor vehicle. I hunted through other newspaper articles and had a look at the sources cited in the City’s report on the Lake Shore properties. I eventually read an 1896 Globe article which describes what was, or so the reporter believed, the first running of this vehicle. The article mentions Fetherstonhaugh and Dixon, and also William Still, the engineer who designed the motor vehicle. The unnamed author of the article seems to think this event in late 1896 was the first example of an automobile in Toronto, although I have been burned by mistakes and typos in old newspaper articles before. Information simply wasn’t as available to the general public back then in the way that it is today, and sometimes newspaper accounts are wrong. (Also, sometimes newspapers deliberately lie, but that’s another story.) Maybe an automobile had been on Toronto streets earlier than December of 1896, and the Globe just hadn’t known about it. The problem was that I kept finding other history articles about this vehicle which gave the year as 1893. Like this one. And this one. And this one. And this one. And this one. And there were other books which gave the year as 1893, too. Is there another source out there that I just can’t find? Or had the writers of all these other articles simply taken the year from either the photo caption or Mike Filey’s 1979 article, and not looked for any confirmation in primary sources? Anyone who has taken a history class at the university level probably heard a lot about primary sources and how important they are. You were probably told to cite a minimum number of primary sources in your essays. I certainly had this experience, but the significance didn’t really sink in for me at the time, perhaps because at Queen’s I mostly studied western Europe during the Renaissance and Reformation years and couldn’t do all that much with primary sources given that I do not understand Italian or Spanish or German. In my essays, my primary sources tended to be translations of Dante. Popular history, of course, isn’t academia. The language and tone changes. Popular historians are often eager to make their writing more fun and engaging, and this is great; what is the point of history if you aren’t aiming to share it with more people? Some Toronto popular history writers, however, also throw away the academic need for citations and crediting sources, and when this happens, the readers don’t know where the information is coming from. Few, if any, of the contemporary pieces I found about the Fetherstonhaugh car indicated what the source material was. As I got increasingly frustrated with my inability to find any clear evidence that this car existed in 1893, I took a trip to the City of Toronto archives to have a closer look at the original photo. As you can see from the image (it is perhaps clearer in this other copy of the same photo), there is a sign hung on the front of the car, and I wanted to know what it said. The first motor vehicle made and operated in Canada. Built in 1893. This carriage was built for F.B. Fetherstonhaugh in 1893 by John Dixon, and equipped by the Still Motor Co. Limited with motor and batteries made by W.J. Still. It was exhibited in the Toronto Exhibition in 1893 and created quite a sensation in front of the old grandstand on account of it being the first horseless vehicle made or operated in Canada. Alright, so this sign indicates the year of the vehicle’s debut as 1893. But how reliable is this sign? Well, for one thing, it claims the Fetherstonhaugh car was the first automobile in Canada. I haven’t looked into this too closely (I was writing this article on a deadline), but none of the other sources I’ve checked seem to repeat this claim. For what it’s worth, the Canadian Encyclopedia says Canada’s first motor vehicle was as early as 1867, almost thirty years before the Fetherstonhaugh car. If this was wrong, could the rest of the sign’s text be wrong, too? If so, though, this would seem remarkable. 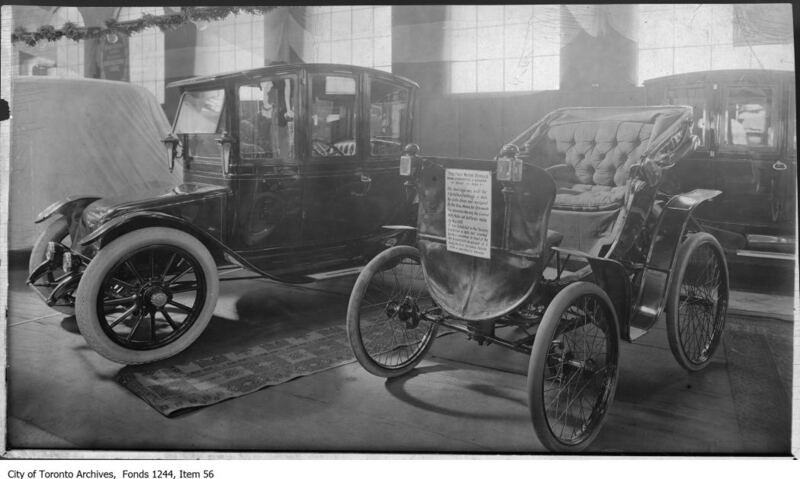 The photo is dated 1912, and supposedly from an automobile exhibit at the Toronto Armouries, meaning that the details of Toronto’s first car could have been forgotten a mere twenty years after its construction. Fetherstonhaugh was still alive at this time. To be fair, though, think of recent innovations. When was the first e-mail sent in Toronto? Who was the first person in Toronto with a PDA? People didn’t realize just how important cars were going to be, and thus hadn’t busied themselves with documenting their development. I talked to a staff person at the archives about the photo and the William James collection. She informed me that the captions on the photo were added many years after the photos were taken. If I recall rightly, they were added by the photographer’s son, who was going by what he remembered his father telling him, so there’s certainly margin for error. In fact, the photo might be earlier or later than 1912. All we really know is that this car was at some time put on display, and that this sign hung in front of it. So where the hell did this leave me? Well, I had the Globe article describing the supposed first test of this vehicle in 1896. I found a Star article from 1901 which says Fetherstonhaugh’s car made its debut in 1896. It turns out that Mike Filey wrote a later article, published in Toronto Sketches 10 (Dundurn, 2010), which also gives the year as 1896. But some times in the early twentieth century, all the sources started giving the year as 1893. (The earliest newspaper article I could find which gave the year as 1893 is a Star article from 1936.) Did everyone just trust the sign in the photo? And why did whoever make the sign choose the year 1893? I decided I might have more luck tracking down accounts of the vehicle being displayed at the Exhibition. 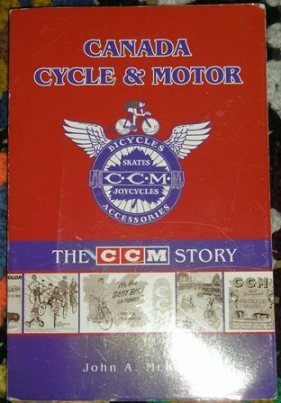 I started by contacting the CNE Archives. Their staff got back to me almost right away, which was superb of them. The first reference to automobiles at the CNE that they have is in an 1897 program. So far, I have been unable to find an actual newspaper account of such an exhibit in 1897, but that does not mean that one does not exist. The closest thing I have so far is a Globe article from 1897, from just before the Exhibition, which says that somebody is “negotiating for an exhibition of horseless carriages at our great fair.” The tone of the article certainly suggests this would be the first such exhibit. The 1898 account I found of an automobile display at the Exhibition neither says it was the first automobile display at the Exhibition, nor says there had been such an exhibit in previous years. Maybe the 1897 exhibit somehow flew under the radar. It probably seems incredible that automobiles could fly under the radar, but it would not really surprise me. Although there is interest in automobiles throughout the 1890s, they are mostly seen as an amusing novelty, as opposed to something that people actually expected to own for themselves. The early motor vehicles were not especially fast or practical, especially not for Torontonians, given the state of Toronto’s roads at the time. The 1896 Globe article I found about the test of the Fetherstonhaugh car is buried halfway down on page eight (the Globe only had twelve pages back then), under a Reverend’s description of a locust cloud he saw. This wasn’t front-page news. Then, I had another breakthrough. Poking around on Google, I discovered that you can use Google to search patents. Searching for patents issued to William Joseph Still (who designed the motor in the Fetherstonhaugh car), I found two different motors which he had patented in 1893, including one where the patent had Fetherstonhaugh’s name on it. Pressing on, I found other patents with both Still and Fetherstonhaugh’s names on them in later years. It looks as if Still’s initial inventions may have been patented in 1893, but that it may have taken the remaining few years to invent the other necessary components and to design and construct a vehicle, which was then first tested in 1896. Somebody may have seen the year of the patent and assumed it was the year that the car first ran. There’s not much that I can do to test this theory, and as I had a deadline to make with Torontoist, I had to stop my research here. I am pleased to at least have a working hypothesis, but of course this could all be disproven by somebody having an actual primary source from 1893 describing the vehicle as running. There is, however, still one nagging discrepancy. Take another look at that photo. The 1896 Globe article announcing the new motor vehicle’s existence says “this is carriage is a tricycle.” And that car definitely has four wheels. Oh, hell. I can think of a few different solutions to this problem. One is that the vehicle was tinkered with after it was first tested, with the design altered until they found one that seemed to work. Another is that this is only the rear of the vehicle, and the motor and batteries could have been in a separate unit up front which pulled it like a locomotive. Another is that the Globe article is wrong about the carriage being a tricycle; maybe the person writing the piece hadn’t personally seen it, and got it confused with another design. And another, of course, is that the vehicle in the photograph is not actually the car that they tested in December of 1896 at all. These sorts of things happen when researching, especially in Toronto history when one is frequently in uncharted territory. One of the challenges with popular history is being able to write engaging text when you don’t have all the facts available. When I am uncertain of a fact, I either have to qualify it with terms like “believed to be,” or else allow for the possibility of an unreliable source, with phrases like “according to an article in the Globe.” That way, if somebody else uncovers another source (and there’s an excellent chance that they will! ), the new information will still fit with my article instead of completely discrediting it. And the information that I cannot reconcile, well, I often have to leave it out. I didn’t mention anything about secondary sources citing the year as 1893, and cropped the caption out of the photograph. I didn’t mention the gold coin, which was issued in 1993, presumably for what was believed to be the car’s centennial. And I left out any mention of the number of wheels. Sometimes, if I think it might be interesting to the layperson, I mention the discrepancies. For example, in this article I wrote about Festival Express, I note that the newspaper descriptions of the violence leave a different impression than that presented by Ken Walker in the documentary film. Usually, though, if I can still tell a coherent narrative without such things, I leave these bits out. So, for any researchers or aspiring public historians out there, be careful and diligent in your work. Don’t blindly trust the captions on photographs or the articles written by other historians (not even mine! ), and question what you read. If you’re going to claim something that you cannot personally prove, that’s fine — you can’t be expected to look up every single little thing — just leave some information as to where you got your information from. I usually avoid footnotes because they can make a piece look like a university essay, and that can turn off readers who mentally associate footnotes with boring history. But when I can, I try to mention heavily used sources in the body of my text, and I usually leave a list of sources at the bottom of the page. And I keep all my notes and sources for myself, so that if anybody wants to question a specific point or do more research on their own I can also supply readers with more detailed information. Anyway, this post turned out far longer than my actual article (which, again, you can read here). I hope at least one of the two is actually interesting. I don’t expect to get into the regular habit of doing “behind the scenes” posts for all my articles, but this seemed like a great opportunity to highlight some of the issues one runs into when doing social history, while also explaining why some of the information in my article might contradict what people have read elsewhere.